Dr. Kiran Bedi this morning did door to door campaign and addressed Nukkad Sabhas in her Krishna Nagar assembly constituency. 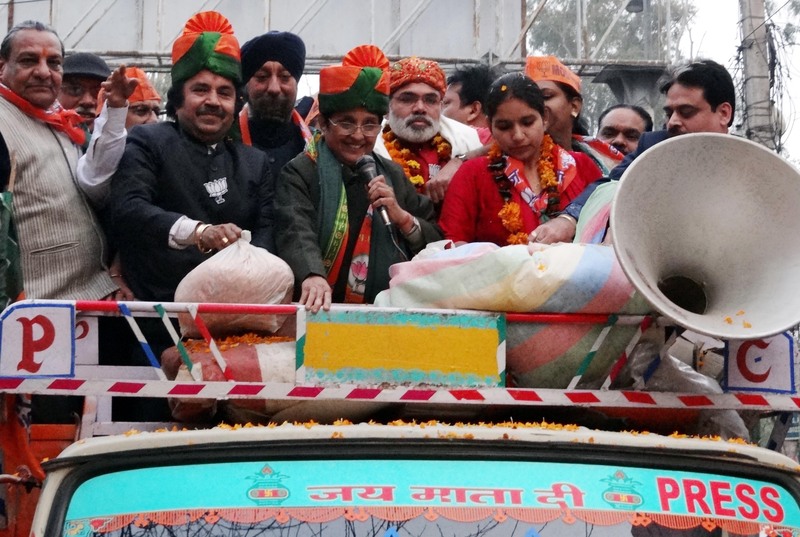 Dr. Bedi today did a mammoth Road Show in north Delhi’s Wazirpur, Shalimar Bagh, Adarsh Nagar and Tri Nagar constituencies accompanied by local candidates Dr. Mahender Nagpal, Smt. Rekha Gupta, Shri Ram Kishan Singhal, Dr. Nand Kishore Garg, District President Shri Sanjeev Sharma and others alongwith hundreds of workers. During the road show Dr. Bedi said I have full trust in BJP workers and citizens of Delhi and I firmly look forward to a big victory for BJP. She assured the people that women security, sanitized Delhi, pollution free Delhi, employment surplus Delhi, developed regularized colonies of Delhi shall be on the priority of the BJP Government.